Not too long ago, I received something in the mail that was unexpected and not so appreciated. I got a jury summons. When I saw the date listed on the front of the envelope, I cringed. I thought to myself I don’t have time for this. I have reports to write and emails to send and teachers to visit with. I can’t possibly have time for jury duty. So, I opened my summons hoping that there would be some sign that I wouldn’t be eligible to participate. It wasn’t the case. I had to go. To tell the truth, I was less than thrilled at the idea of driving downtown, finding a place to park and walking inside of the courthouse. What if I got lost? What if I didn’t find the right parking lot? What if once I got there I couldn’t find the right place to be? What if there wasn’t a restroom nearby? Was I allowed to take my lunch? I tried to stop the level of panic that I felt about this by reading all of the instructions on my jury summons. Nothing about this experience was feeling normal, so my imagination went wild predicting that I may be held captive at the courthouse, never to see my children and family again. One of the big reasons that I had so much worry about my jury service was that I didn’t know what to expect. I was worried taking care of my most basic needs. Imagine a new child walking into your classroom. They’ve never been there before. They haven’t met any friends yet. They don’t know what the rules are. They don’t know what toys they can play with or where the bathroom is. They don’t know where to keep their special blanket safe or where their parent ran off to. What kinds of behaviors might you see from them if they have as many worries about entering your classroom as I had about entering jury duty? When children don’t know what to expect and have worries about the things that are happening to them, lots of behaviors can occur, and they are usually the behaviors that no one wants to see. Within the culture of your classroom, it’s important for children to understand that they are welcomed and accepted for who they are. How do you communicate that to the families and children you encounter? Is there an orientation for children and families? Do you post a welcome sign on your door letting them know they are in the right place? Is their cubby ready with their name already posted so they know that they belong? Do you have a picture schedule available to help children know what to expect? I was very fortunate that I met someone who was excited to hear that I was called for jury duty. He was able to explain the parking situation. He gave me an overview of what to expect in my first few hours and most importantly told me that there was a juror orientation that would answer all of my questions. On my first day of jury service, I was able to get where I needed to without many challenges. I found the right room and when I checked in someone even said good morning. Day two of jury service was much more enjoyable than day one because I knew what to expect. 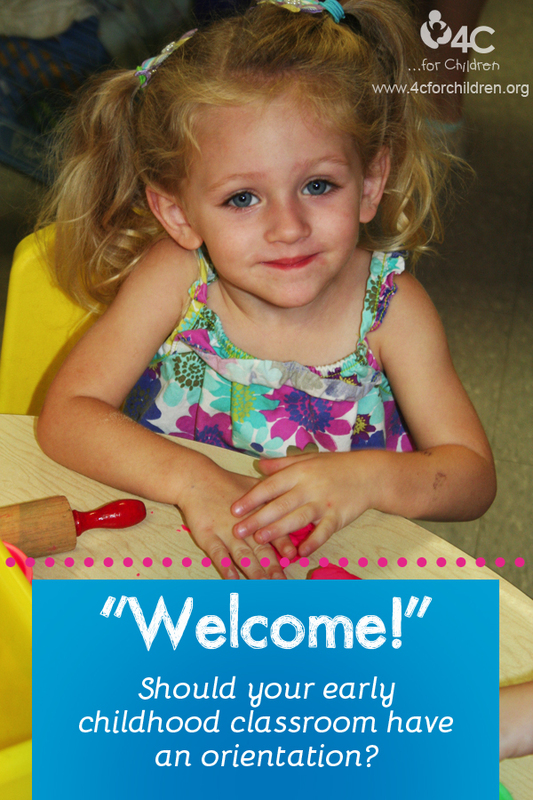 As you have new children and families enter your programs and classrooms for the first time, I hope that you remember the importance of welcoming them into your space. Although they may enter your classroom or program with some initial worries on day one, with consistent orientation processes and a positive attitude from those in charge, day two should always be easier and even more fun. And if you are ever called to jury duty, just enjoy it. I can honestly say that once I stopped worrying, I did. This entry was posted in Best Practice, Early Childhood and tagged child care classroom, class orientation on October 10, 2013 by angiegood. I enjoyed reading your post. As an early childhood professionals, we should realize that like us, children are unsure and sometimes really scared of entering a unexplored environment. Many times parents “dump” their children into these environments knowing themselves that the children will be safe, but the children may not know what to expect from the educator, the peers, and what to do in the environment. Working from my home, I realize the importance of helping a child transition into my home daycare. Sometimes meeting a new parent(s) and their child(ren) is a little nervous for me as well. One thing that I encourage the parents to do is first, have a meet and greet with me so that we can get to know each other and also for them to explore my daycare environment. Next, I ask the parent(s) to bring the child(ren) to do the same. It really makes a big difference when the child explores their new environment with me and the parent(s). From there, most times, the child’s first few days are less stressful because as they transition, they have a feel of what to expect, i.e. “I have been here before” “This is a fun, safe to be” I will be okay here”.